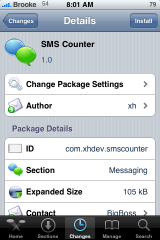 SMSCounter is an application that quickly provides information about the amount of text messages you have, based on a few options. When you open the application, you will get the main screen. 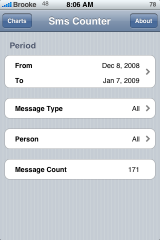 Here you will see a few options; Date, Message Type, Person and Message Count. The application defaults to one month, all your messages, from everyone and then gives you your total. However, If you select the Period option, you are able to change the To and From date. 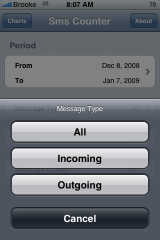 If you select Message Type, you are able to choose All messages, only Incoming messages or only Outgoing messages. 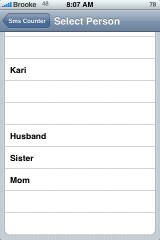 The Person option allows you to choose a specific person. The Message Count displays the number of test messages you have based on the options you have selected. There is also a Charts option in the upper left corner. 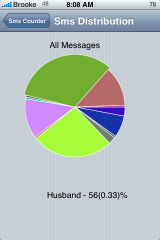 This will give you a pie chart of all your text messages. If you tap on one of the colored portions, you are able to see which contact represents that portion, the total number of text messages for that contact and the percentage of your total text messages they represent. You can affect the chart by changing the Period option on the main page. Some of the smaller portions are impossible to select but, it is still a fun addition to the application. Overall, this is a very simple yet very nicely implemented application. The user interface is great and the application works smoothly. Pretty neat – the charts feature is quite useful. I am not able to get it to save the changes made under the dates. it always goes back to December 8th, 2008. Any reason why this happens each time the app is opened???? It took me awhile to figure this out too, and I was getting frustrated. The ITTY BITTY icons will change when you tap on them directly (aim carefully) and then your settings for dates will persist. A8stract via the MacCiti source. i’m having a really hard time finding this thing what source is it from? hello! i’m also having trouble finding it, what’s the source of this app? Hmmmm installed this on my 2g fw 2.1 and it doesn’t open. This won’r show up for me either. 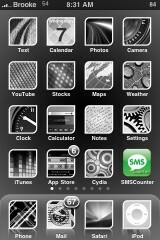 Any one else having the feeling that Cydia doesn’t update properly lately? hi guys, the apps used to work, recently the app doesn’t boot up any more. it just crashes. it might be due to some updates from cydia or maybe some other apps i installed. does anyone have this problem? where is this app? I’ve searched all of the app store and can’t find it anywhere does anyone know where to get it and if there is another one similar to this? Does anyone find it bizarre that any old normal boring mobile phone has a counter for all calls and text messages and yet, the amazing iPhone has nothing? I find that astounding! Thanks, just re-jailbroke my iPhone to download this app! Hey guys any idea if it takes into account the character / message limit? Or does it essentially just count the number of bubbles in your SMS app? For example does it count really long messages as multiple ones (like your phone company would)? I just checked by sending a long one to one of my buddies. It does indeed only count the bubbles. So be aware that the number it shows you is potentially a lot less than what your provider will bill you for (depending on how long your texts usually are). i want this app on the appstore now!!! why isnt it there already??? ?